In 2017, with the help of Brand inc, Nashua was hunting for a unique sponsorship model that ticked all the right boxes: social upliftment, community engagement and a driver of business goals. 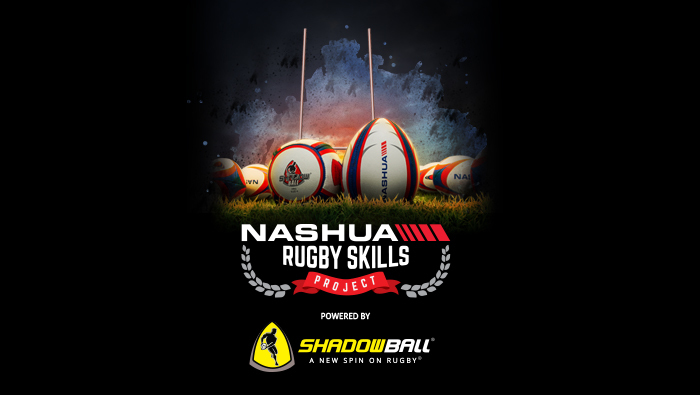 Along came the innovative ShadowBall and a “high-fit” sponsorship was born called the Nashua Rugby Skills Project (NRSP). Nashua Limited is a leading Total Office Provider with a long-standing reputation for supporting South African sports, with a particular focus on rugby and its development. ShadowBall is a South African designed, flat-sided rugby ball that enables solo training and through its Academy has developed scientifically proven programmes that improve a player’s passing and catching accuracy by as much as 266% in just four weeks. Together, the pair form a unique sponsor-brand fit with aligned values and exceptional business impact. While touring the schools and uplifting the next generation of rugby stars, Nashua was able to nurture relationships with the institutions. 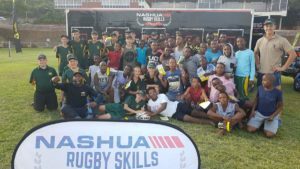 “The NRSP is a one-of-a-kind rugby skills training programme in SA that makes a meaningful difference to rugby skills for school-level players and positively impacts school communities through sport,” says Nashua Head of Marketing, Tish Magongwa. “The positive equity built through the sponsorship has enabled us to build customer relationships, generate sales leads and create a significant ongoing revenue stream,” she says. Former Springbok Gcobani Bobo and learners from Wonderboom Hoërskool in Pretoria. ShadowBall allows 300 repetitions in ten minutes and it’s philosophy centres around two tenets: repetition is the mother of skills and practice makes permanent. Last year the programme reached over 2,346 players and 150 coaches from 73 schools across South Africa, as well as Botswana and Namibia, and has achieved tremendous success in developing rugby techniques and sharing critical life skills with learners. All participating schools have seen increases in their performance and on average, players and teams improved their ball skills by over 50%. Top of the range was the highest recorded individual improvement at 223% and the biggest overall team increase was by Vredendal High in the Western Cape at 114%. Nooitgedacht Primary School won their league in Gauteng giving full credit to the NRSP and several other schools got to the finals of their respective leagues after completing the programme. “What’s really unique about the NRSP is that it connects privileged schools with underprivileged schools through sports,” says ShadowBall inventor and Director, Gary Crookes. “Our mission was to get youth participating in a sport they love, not only to keep them active and healthy, but to allow them the opportunity to develop key skills they can use later in life. “It has been truly life-changing for the children involved – and their families – and can change the way schools teach and train students to nurture future talent. In this way, the NRSP is effectively building a winning rugby nation,” says Crookes. Nashua and ShadowBall have been celebrated for their innovation and were recently shortlisted in two categories with the Sport Industry Awards. The NRSP has been nominated in the Best New Sponsorship and Cutting Edge Sport categories. Excitement is building as winners will be announced at the prestigious Sports Industry Awards to be held in Sandton, Johannesburg in May. “We are so proud of this partnership and what is had achieved in such a short time,” says Brand inc MD, Chris Heaton. “We took a great creative idea with a strong emotional element that we knew would directly grow business opportunities for the sponsor while developing players and our much loved national sport.